Charter University Prep Senior, Jordan Soto will be representing El Dorado County in the State level of the Poetry Out Loud recitation contest in Sacramento on March 18 & 19. Soto, who beat out thousands of other students, had to take first place at the classroom, school-wide and county level contests to receive this honor. Poetry Out Loud is a national competition in which students perform two poems to a panel of judges in an effort to help students master communication and public speaking skills, build self-confidence, and learn about literary history and contemporary life. Winner of the competition, CUPrep senior Jordan Soto, will move on to the next round of the contest performing with other high school students at the state level. The California Arts Council, coordinators of the state level contest, county winners are treated to two days at the California Poetry Out Loud State Finals in Sacramento on March 18 and 19, 2018. Competitors will deliver their poems in the historic Senate Chamber and the contest is webcast and televised via the California Channel. The county champions are also honored with a dinner reception and receive a certificate of recognition from their legislative representative. 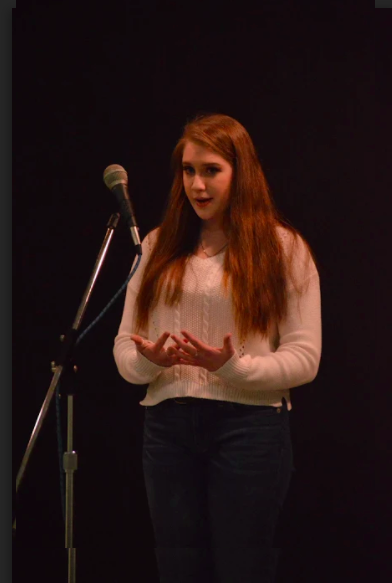 Senior Jordan Soto performs her award winning interpretations of "Famous" by Naomi Shihab Nye & "And Soul" by Eavan Boland.